[MyMagicPudding] wanted to try his hand at hobby electronics, so he decided to go all-in and build himself a PIP-Boy 3000. If the name doesn’t ring a bell, the PIP-Boy 3000 is a wrist-mounted computer from the popular Fallout video game series. 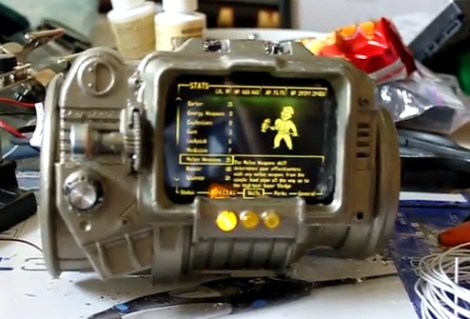 The PIP-Boy is based around an HTC Desire HD mobile phone, which [MyMagicPudding] mounted inside case custom made for him by [Skruffy] from the Replica Prop Forum. He wanted to stay true to the game, so the wrist-mounted computer’s interface eschew’s the Desire’s touch screen and is instead controlled via a set of buttons and dials on its face. The external inputs all interface with the Desire via an Arduino Uno, which communicates with the phone using TCP over USB. While he admits that his soldering skills are pretty dodgy, and that there’s no longer room behind the neat-looking facade to mount the PIP-Boy on his wrist, we think that it looks great. If this is an example of his first electronics project, we can’t wait to see what comes next. Continue reading to see the PIP-Boy 3000 in action. That’s a really neat idea thanks, I’ll give that a try. I’m a long-time reader of Hackaday so I’m delighted to see my project on here! This would probably be even more slick then making buttons out of the LEDs, but it would likely take a lot more room in his prop. anyone else notice the face on the upper right? It is where the Rad meter would be in the game. If i was him i would have made it into a volt meter for the battery pack. Maybe for v2. I like how after he says “it’s far to full to contain my arm…oh well” he pans over to the Dremel tool, like the next step is to grind down his arm to fit. I was planning on a map, but I ran out of time before Comic-Con. Now I’m back I’m starting from scratch to get everything a better fit, but I’ll get to the map eventually. Just curious, but what software/language/library/other did you use to implement the interface itself? It’s an Android app I wrote that uses graphics and sound from the game. It’s a native C++ app using the GLES and OpenSL libraries exposed in Gingerbread, but that’s only because I don’t know Java, I’m sure it would have been much easier using the proper Java APIs. Any chance of a release on the market? Very slick – very nostalgic! Enclosures like these are done with simple injection molds and ABS(on the good ones) mix. Too bad nobody does guides on proper injection molding.. it makes any enclosure you can immagine.. I have read and have been told even small volume injection molds (under an ounce) take quite a bit of pressure and the equipment ain’t cheap. Lord knows how expensive something this size would be injected. None the less somebody with background really aught to put out a diy for one. Vac forming is 800X faster than injection molding. plus if you know what you are doing you can make some very good detail. Honestly plastic is the cheaters way out, you can do a fiberglass enclosure that is 800X stronger and incredibly hollow easily. Not really, fiberglass can’t hold a surface without double resin methods, it and vacuum molding resins has never been able to do accurate edges.. Pure polymers and injection molding are used by big names for a reason..cheaper and more accurate. You use ABS it’s way more durable than fiberglass because it activates to impacts too. You can make fiberglass castings and molds really easy, the vacuum method is unnecessary for a reasonable pull. Fiberglass materials are also very common as they’re used for fixing and detailing cars. I’ve done it a lot, it really isn’t that hard. However, injection molding? I think the reason why there aren’t any good tutorials is because it’s a pretty involved process. Not only do you have to make the injection device but you need to make the molds too. By all means, please post some relevant links for easy to do DIY injection molding. fiberglass just doesn’t detail well on small complex molds like this. I don’t do a tutorial because like you said it’s an involved process, and I already have too much work in a day. He should have used a Teensy…a lot smaller and still more capable than the Uno…and it works with Arduino IDE. Also, I don’t think it qualifies as “working”…it doesn’t even pause time! This is very cool I have been meaning to make one of these myself for a long time. Now you have given me more inspiration. This build is absolutely incredible! I can already tell what my first Thing-U-Matic print needs to be now: A custom PIP-Boy 3000 enclosure for my Droid 2 Global, with special custom interface buttons/dials. I just need to start designing the circuitry ahead of time… The nice thing is, if I buy a new phone I can just reprint the enclosure! Funny that you mention it, I’m in the process of adapting the fallout 3 game model of the PipBoy to be printable as a phone enclosure. It is a GIANT pain. Unfortunately I’m expecting I’ll need to redo the entire model unless there’s a better one out there. Can you say “constructive criticism”? Seriously though, I welcome better ideas; I’m a beginner at this. I’ve already noted the teensy idea above, thanks! If you use the ATMEGA328 with a crystal and a few other components you can drastically reduce the size of the Arduino. Google Arduino on a breadboard and a few tutorials should come up :) If you’re lucky you can even buy pre-bootloaded ATMEGA chips so you don’t have to fiddle around with programmer units. Also you can swap out the Desire with an OLED screen or something like it. It should conserve space. Some of the buttons and dial can be found in “micro” editions and then you can add a larger plastic button/dial top over the micro switch/dial. It is also possible to get push buttons with integrated LEDs. If you cannot find any that are compatible with your project then try ebay. I hope this helped :) You’re welcome to send me an email, there’s a contact for on my website – just click my username. Didn’t hackaday have an article of an arduino all on one chip. With all the components just mounted on top of the chip? That seems like it would be a good swap if small size is needed. HTC desire supports full USB host, so just slap Atmega8-l with V-usb software emulating joystick. Hell you can even buy cheap USB joypad and cannibalize PCB from it if its small), connect buttons and potentiometers you want and connect that to the phone. No arduino needed. I didn’t know about the USB host supprt, that’s actually awesome, thanks. BTW…how does the V.A.T.S work? The game wasn’t terribly clear on that…how do you use the dials and display to select targets? I’ll give you 3000 caps for that! sparkfun sells different colored tactile led pushbuttons that arent SMD and they also sell breakout boards for them too.Tactile Led Pushbutton! Ive been keeping those in mind for a few projects. The pip-boy looks great by the way. I was just thinking about how useful a pipboy would be for my personal use. I am not that creative and know very little about electronics and all that but I four.d this hoping some one had maybe found a way to do what I wish I could. I was thinkin of something similar to the design but with a working phone and arm holster with the texting/data capability of a phone. With similar apps like a note pad a head phone Jack for talking. Just an idea I had. maybe it doesn’t seem practical to others but the way I do things day to day it would be perfect for me.